Throughout the life of the Taskforce, our focus has been on consulting as widely as possible on our work, for example, in agreeing the Libraries Deliver: Ambition strategy and its associated action plan. We work closely with our partners around the Taskforce, including the Society of Chief Librarians and CILIP - both of whom have access to networks of people who work in libraries - and we have established a number of channels through which we share our work directly, including the website, blog and twitter. We know, however, that there is still a long way to go before information about the work being done at a national level is widely known, and in particular by those who work in libraries - meeting people every day and delivering the activities that feature in our case studies and blog posts. So as a step to improve how we “communicate with the front line”, we’re starting with this newsletter [download your copy via link]. UPDATE: Find a higher resolution copy here. This single sheet will appear monthly, and is designed to be printed out and pinned to noticeboards - recognising that many of the people who work in libraries don’t spend their days looking at computer screens and checking emails, but in almost every library we have visited there is a staff area or teapoint with a noticeboard! We are equally happy to adapt these plans based on feedback from the intended audience - so we also include a call to action which invites people to give us feedback on this newsletter and suggest other information they would like to see included. We’re building a mailing list for the newsletter - please sign up to receive your copy each month via this google form. If the form doesn’t work for you, please email librariestaskforce@culture.gov.uk with “Libraries Deliver newsletter” in the subject line. The only information we need is an email address and which local authority area you are in - to give us a picture of where in the country we are reaching. Community managed libraries are also very welcome to sign up. We will not use the email address provided for any purpose other than sending out this newsletter. 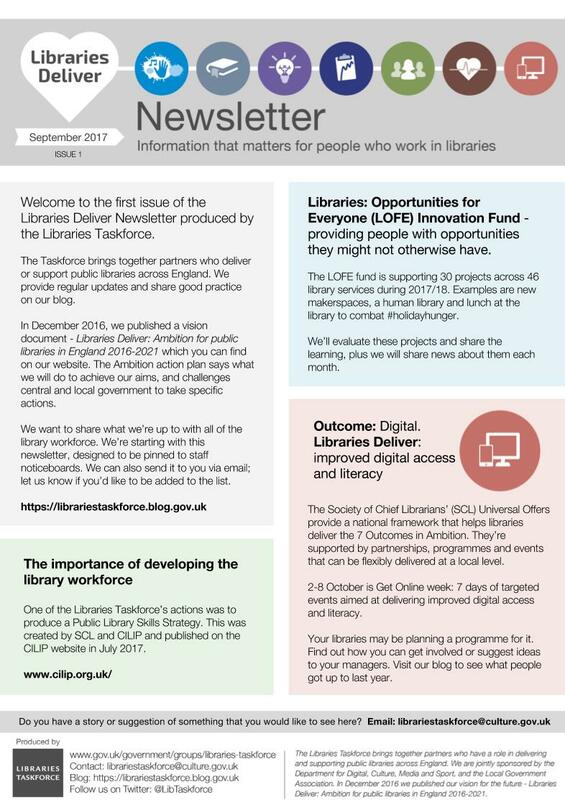 As a reminder, the newsletter is designed to be printed and displayed, so if you are able to act as a distributer for several libraries, that is welcome, but we are equally happy to send to as many individuals as are interested. Please share with other people in your network, and invite them to subscribe. UPDATE: All issues of the newsletter can be found via this page on GOV.UK. UPDATE March 2019: This newsletter has ceased publication.